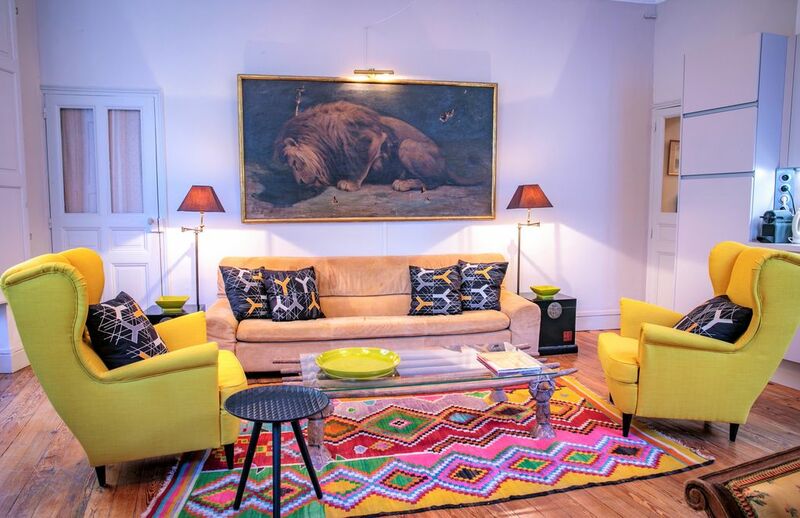 This beautiful 70 m2 apartment is very well located in the heart of the historic center of Avignon on the 2nd floor of a building (no elevator) .Décoré tastefully, it offers a warm and refined atmosphere. You have 70 sqm with 3 bedrooms, 1 bathroom, 1 separate toilet, large lounge / dining room of 35 m² with a fully equipped kitchen area. - Room 1: Double bed 140 (high quality bedding). - Bedroom 2: Double bed 140 (high quality bedding). - Bedroom 3: 2 single beds (high quality bedding). - Quality bathroom double sink, 120/90 shower, towel warmer, washing machine, hairdryer. - Large living room with very high ceilings, 4 large windows (double glazing), renovated period parquet, with 5-seater sofa, coffee table, dining room table with extension for 8 persons, flat screen TV 81 cms, Free box 250 channels, internet, WIFI. Space Kitchen: refrigerator, dishwasher, oven, induction 3 lights, extractor fan, toaster, Nespresso coffee maker, dishes, cooking utensils and household products. All linen is provided: bed sheet, duvet, towels, tea towels. At your disposal: iron and ironing board, vacuum cleaner, guides Avignon and its surroundings as well as a personal selection of the best place! The location of our apartment allows you to easily walk to different historical and cultural places of the city as well as shops without having to use your car. At the foot of the place of the clock, 2 minutes from the Palais des Papes and the Petit Palais, in the street of the tourist office, our address is ideal to visit our city. not forgetting the famous Pont d'Avignon and many more !! Stay in Avignon allows you to visit the region that offers many sites to see absolutely: The Alpilles (St Rémy de Pce) are 25 kms, Arles Roman city and the Camargue are 35kms. Luberon and all these picturesque villages (Gordes, Roussillon, Lacoste ...) are between 30 and 40 kms. Marseille is 80 km and its surroundings such as creeks, Cassis and its coves to discover. Montpellier and its large sandy beaches are 1 hour drive. The TGV station is about 10 minutes from downtown by taxi and train station Avignon Centre is 800 meters away. You can book our parking (parking oratory), 200 meters from the apartment (optional: 40 euros). The rental of this luxury apartment is the preferred option for those wishing to explore the city of Avignon, Heritage and the entire region of Provence. You will find in the street of the building all the shops need to enjoy your stay (restaurants, pharmacy, bakery, supermarket, banks, shopping ...). I am always available to respond quickly to your requests through the application Homeaway smartphone before and during your stay! Large character apartment situated centrally in the town. Perfect apartment, perfect location, perfect host. The location was perfect, the apartment was immaculate and just perfect for our family. This is a very French charming apartment in the heart of the old town. Christèle was very accommodating and responsive to my needs and questions I had during my stay. My husband and I stayed 6 nights and found this quiet apartment was very convenient for exploring Avignon and finding excellent nearby restaurants. The beds were comfortable, the shower and the washing machine were great and as we are older, it was nice that the person checking us in was able to carry our suitcases up 2 flights of stairs to the apartment. The living room is large, but is furnished with quite a lot of uncomfortable furniture. The sofa and one armchair were fine, but it would be hard for more than 3 people to relax! As with most apartments in France, there was no air-conditioning, but 3 fans kept the bedrooms comfortable. The responsiveness of the owner was stellar; she was a delight to work with. Stay in Avignon allows to visit the region that offers many sites to see. Alpilles (St Rémy de Pce) are 25 kms, the Roman city Arles and the Camargue are 35kms. Luberon and all these picturesque villages (Gordes, Roussillon, Lacoste ...) are between 30 and 40 kms. Marseille is 80 km and its surroundings such as creeks, Cassis and its coves to discover. Montpellier and its large sandy beaches are 1 hour drive.